As noted in our history page, construction of the Charlestown Swimming Pool commenced in August 1968 and it was opened to the public in July 1971. Over the years, work has been done to provide filtration and new dressing rooms. After years of settlement and chlorine use, the pool itself has experienced a few cracks and minor erosion of the concrete. In addition, our summers are just not what they used to be and it is a challenge to convince the younger generation to embrace our cold-water pool. As a result, the number of patrons have declined and we have had to resort to only providing one week of water safety as opposed to our historic two week sessions. Therefore, the time has come for change. The founders of the Charlestown Swimming Pool had great vision. We want to continue with the strong tradition of providing a swimming pool facility for Charlestown and the surrounding areas. A Construction Project Advisory Committee was established to obtain the expertise of local contractors and evaluate the options available as a result of the Feasiblity Study. Current committee is : Seamus Bermingham, Andrew Callahan, Luke Doherty, Padraic Dunleavy, Kevin Durcan, Michael Hanley, Kevin McCudden, Maureen McEntire, Mike Baillie. 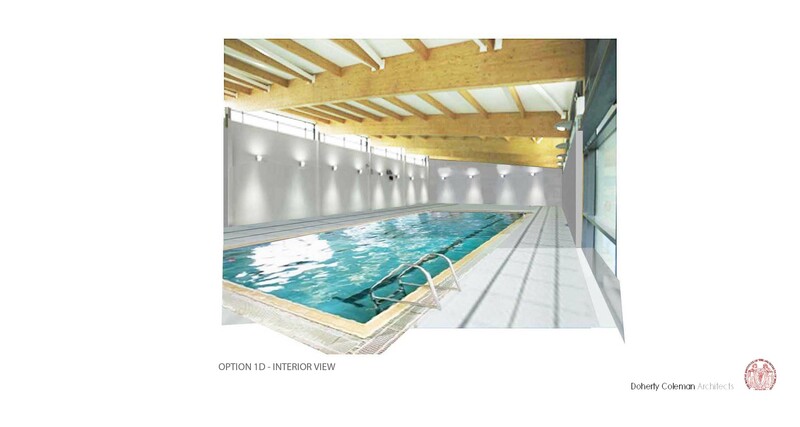 In 2011, the current Swimming Pool Committee, obtained approval from Mayo North East Leader to perform a feasibility study to determine the future of the pool. A number of architects were invited to tender for the Feasibility Study. Doherty Coleman Architects were awarded the project. Decisions were based on price, experience and the team involved in the project. The Feasibility Study was completed on 30 April 2012.